Every connection under the sun, good price and a gorgeous display - what more do you want? The battle for ultimate image quality has been left to VA and IPS panels. Until recently, VA technology looked to have the edge for consumer displays. But with its latest 24 incher, HP has dragged IPS technology right back to the top. It matches the very best PVAs for colour saturation and all round visual pizazz. Admittedly, it does fall very slightly short in terms of contrast and black levels. But it makes up for that with colour accuracy, in part thanks to a wide gamut backlight, snappy response and nary a hint of input lag or inverse ghosting. 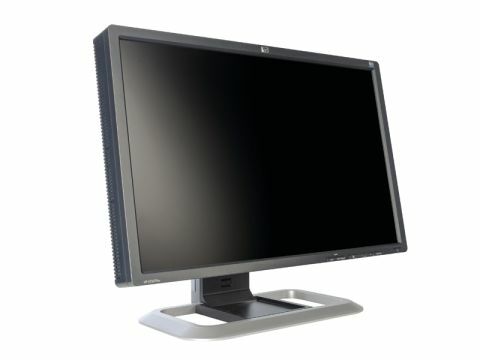 HP has also bequeathed the LP2475W with a monster array of inputs including two DVI ports, HDMI, DisplayPort, VGA and component. And all for a highly competitive £412. It is, in short, our new favourite.